Powidl is a simple recipe for plum butter that takes time and someone to stir it often so that it doesn't burn. 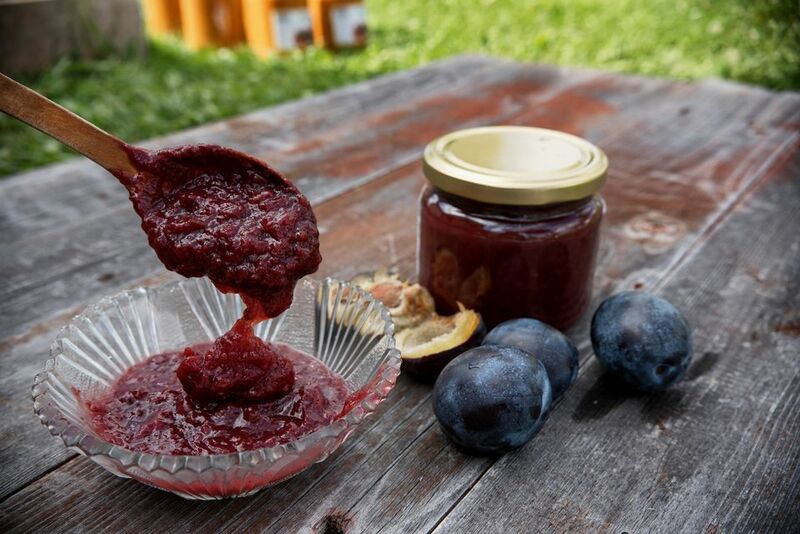 Italian plums, Damsons or Zwetschgen can all be used for this jam, which is used in many recipes as a filling. There is no added sugar in this recipe, just concentrated plums. Makes 3 1/2 cups of plum jam. Wash the plums and cut them into small pieces (1/2 inch or so), removing the stone as you do it. Place them in a heavy pan and pour a little water in the bottom, no more than a half a cup. Bring the plums to a boil, stirring often so that they don't burn on the bottom. Add the cinnamon stick and the cloves. Place the cooked plums in a ricer or sieve and stir to remove the skins and spices. Bring the jam/butter back to a boil until it has reduced as far as you want it and is very thick. Ladle the butter into clean, boiled, preserving jars or into freezer bags. Freeze or ​can, as you wish. Put screw caps on jars and screw down until just tight. Place the jars into a pot of boiling water, make sure they are covered with two inches of water. Boil for 5 to 20 minutes, depending on your elevation. Note: You may choose to freeze jam in freezer jars or freezer bags instead of canning them. Using 1 cup per bag is recommended. Remove jars from boiling water using tongs and invert onto towels. When they have cooled a little you can turn them back over. The lid should be depressed and not give way when pressed (showing that it has a vacuum seal).